Trim some black cardstock to fit your card blank and repeat with white to fit the black. 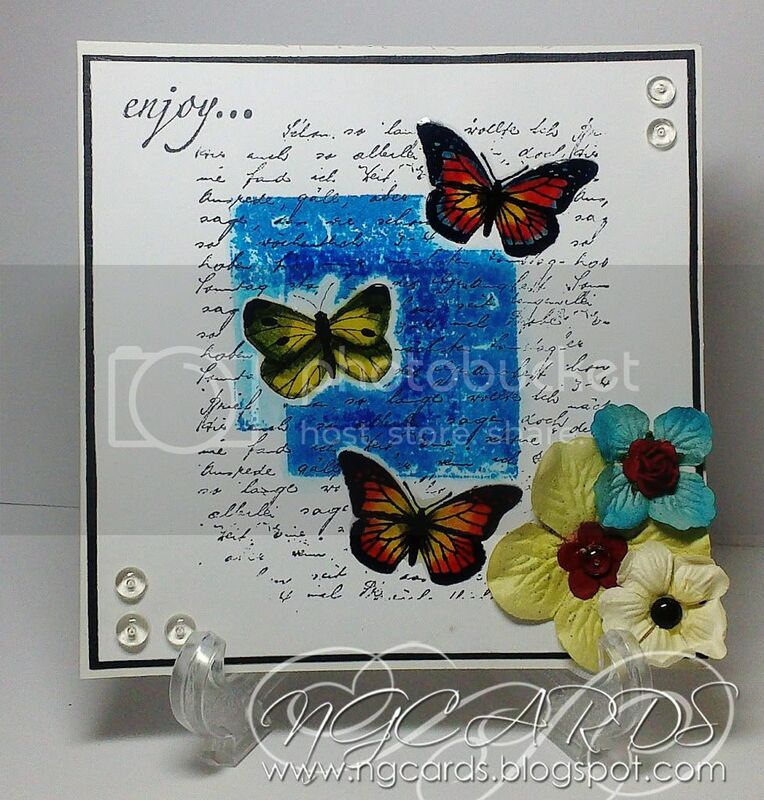 Stamp 3 butterflies in an arrangement that you like and repeat onto some spare cardstock. Trim the butterflies from the spare piece and place on top of the ones that are on your card. By placing another butterfly on top of some you've already stamped allows you to use the technique of Masking. Ink up the script stamp and place in the centre of your card, when you take the stamp away and remove the cut out butterflies you will see that the background stamp has avoided stamping over your butterflies! Repeat this process next by pressing down the 'Salty Ocean' Ink Pad from the Summer Ltd Edition set instead of a stamp. Colour in your butterflies using Distress Markers. Stamp the 'enjoy...' stamp from the T-Set in the top left corner of your card. Embellish your card using an assortment of flowers in the bottom right colour in colours related to those you have used on your butterflies then add some dew drops. Finish your card by highlighting your butterflies with 3D Gloss!